Are you ready for the latest Kills of the Week post? These carebears weren't ready, and that's why their ships got transformed into killmails. Let's take a gander at some of the killmails generated during the week of October 13th @ 00:00 EVEtime through October 19th @ 23:59 EVEtime. 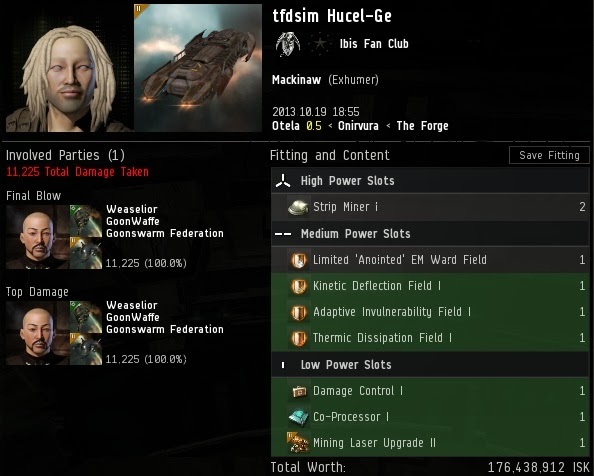 tfdsim Hucel-Ge, sporting a computer-generated name if I've ever seen one, lost a Mackinaw with no less than four active shield hardeners. Actually, it would be more accurate to say they were inactive shield hardeners, since none of them were turned on. tfdsim's bot-aspirancy didn't sit right with Agent Weaselior, who executed the criminal. But wait! Weaselior suicided a Brutix Navy Issue to perform this gank. 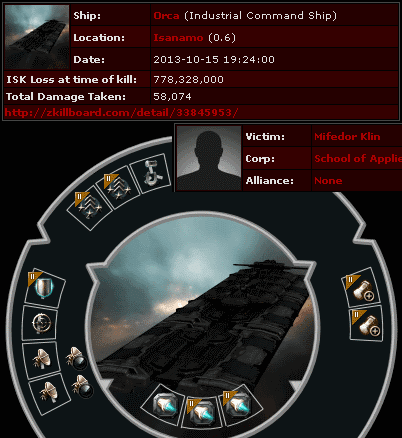 It's not every day that someone ganks with a faction battlecruiser. You might even question whether this was a waste of isk. But you'd be wrong. Weaselior happens to be the Goons' Chief Financial Officer, and he knows a good investment when he sees one. When you invest in the future of highsec by killing carebears, you always profit. ...It's complicated. In addition to two illegal Mackinaws, Galehund was carrying a sizable collection of blueprints. Killboards have difficulty valuing blueprints. 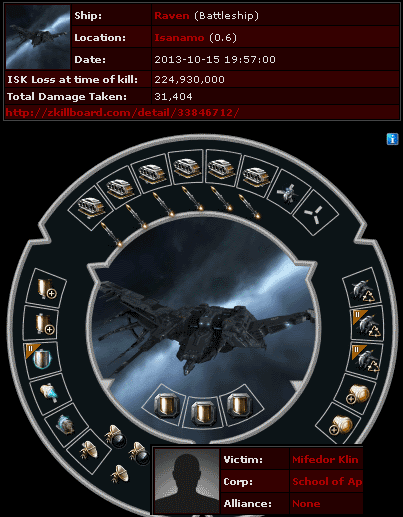 The ZKillboard killmail estimates a total value of 3 billion isk lost, but who knows? Whatever the value, it's more than the 10 million isk Galehund skipped out on by not buying a permit. Yes, half an hour later, Mifedor lost a dartboard-designed Raven. He was apparently seeking revenge. But Bihiri Nova's Skiff emerged victorious once again--with assistance from Agent CONCORD Police Commander, who sinks a surprisingly large number of rebel battleships these days. 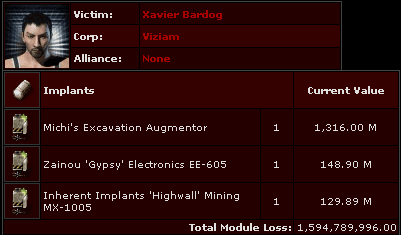 Xavier Bardog lost the Pod of the Week after Agent Direct Intervention discovered him mining without a permit and killed his Hulk. 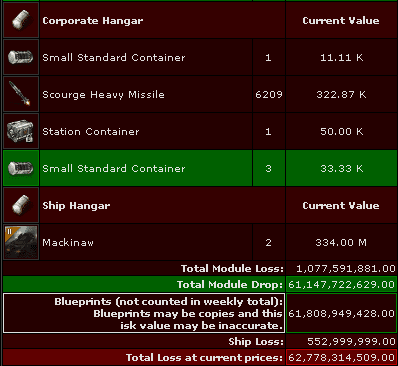 Just shy of 1.6 billion isk spent on three implants. Notice anything missing? There are no learning implants to be found. It seems Xavier spends all of his time mining, and very little time learning. Agent D400 didn't kill the Pod of the Week, but he made up for it by killing the Shuttle of the Week. 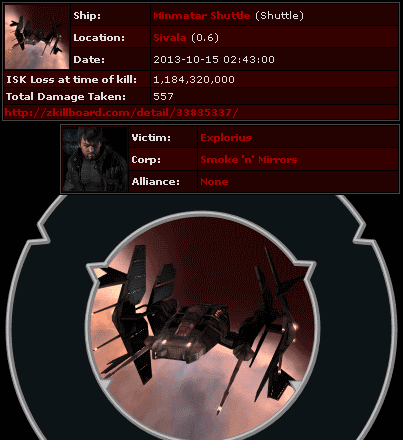 Explorius managed to lose a Minmatar Shuttle worth nearly 1.2 billion isk! Why in the world would a shuttle be that expensive, though? Bad news for the bots and bot-aspirants of highsec: It looks like Explorius accidentally sponsored the next two months of D400's Code enforcement operations! I seem to have terrible luck with missing KOTW. Kill a skiff with a suspect bait and it's after the post has gone up. Beware the SKIFF OF DOOM! Also, we are trying to get D400 to send out autographed portraits to his many fans. One of the best/funniest weeks I remember! Half tempted to train up Exhumers just to give that Skiff of Doom a go. Seems like good fun! Still say it was stupid to gank with a faction BC. A t2 catalyst would have sufficed if those hardeners were indeed not activated. It was not. Weaselior is one of the wealthier members of goonswarm in addition to being the CFO. He's doing it because he can, not because it's necessary. Looking forward to the story of the Skiff of Doom. Great. Lead off with a killmail generated by a member of GoonWaffe. There is NO WAY that the purveyors of tinfoil conspiracies would EVER seize on that as a definitive link between GSF and the New Order. I pray that we don't have to listen to the conspiracy theorists' drivel. Weaselior was one of the first investors of the New Order. There is nothing wrong with spotlighting the actions of one if our own.